Collier's was an American magazine, founded in 1888 by Peter Fenelon Collier. It was initially launched as Collier's Once a Week, then changed in 1895 to Collier's Weekly: An Illustrated Journal, and finally shortened in 1905 to simply Collier's. The magazine ceased publication with the issue dated for the week ending January 4, 1957, though a brief, failed attempt was made to revive the Collier's name with a new magazine in 2012. As a result of Peter Collier's pioneering investigative journalism, Collier's established a reputation as a proponent of social reform. When attempts by various companies to sue Collier ended in failure, other magazines became involved in what Theodore Roosevelt described as "muckraking journalism." Peter F. Collier (1849–1909) left Ireland for the U.S. at age 17. Although he went to a seminary to become a priest, he instead started work as a salesman for P. J. Kenedy, publisher of books for the Roman Catholic market. When Collier wanted to boost sales by offering books on a subscription plan, it led to a disagreement with Kenedy, so Collier left to start his own subscription service. P. F. Collier & Son began in 1875, expanding into the largest subscription house in America with sales of 30 million books during the 1900–1910 decade. With the issued dated April 28, 1888, Collier's Once a Week was launched as a magazine of "fiction, fact, sensation, wit, humor, news". It was sold with the biweekly Collier's Library of novels and popular books at bargain rates and as a stand-alone priced at seven cents. By 1892, with a circulation climbing past the 250,000 mark, Collier's Once a Week was one of the largest selling magazines in the United States. 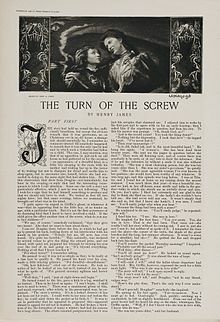 The name was changed to Collier's Weekly: An Illustrated Journal in 1895. With an emphasis on news, the magazine became a leading exponent of the halftone news picture. To fully exploit the new technology, Collier recruited James H. Hare, one of the pioneers of photojournalism. Collier's only son, Robert J. Collier, became a full partner in 1898. By 1904, the magazine was known as Collier's: The National Weekly. Peter Collier died in 1909. When Robert Collier died in 1918, he left a will that turned the magazine over to three of his friends, Samuel Dunn, Harry Payne Whitney and Francis Patrick Garvan. Robert J. Collier won a lawsuit against Postum Cereal Company and awarded a $50,000 in damages, but in 1912 an appeals court then handed down a majority decision that Postum deserved a new trial. The Postum Company believed that Collier's weekly used magazine coverage to attack their company's products in retaliation for not advertising in Collier's after Collier's wrote against a Grape-Nuts's claim that it was an "A Food for Brain and Nerves." Postum then bought advertising pages in major newspapers in retaliation. The magazine was sold in 1919 to the Crowell Publishing Company, which in 1939 was renamed as Crowell-Collier Publishing Company. In 1924 Crowell moved the printing operations from New York to Springfield, Ohio but kept the editorial and business departments in New York. Reasons given for moving print operations included conditions imposed by unions in the printing trade, expansion of the Gansevoort Market into the property occupied by the Collier plant and "excessive postage involved in mailing from a seaboard city under wartime postal rates. After 1924, printing of the magazine was done at the Crowell-Collier printing plant on West Main Street in Springfield, Ohio. The factory complex, much of which is no longer standing, was built between 1899 and 1946, and incorporates seven buildings that together have more than 846,000 square feet (78,600 m2)—20 acres (81,000 m2)—of floor space. Collier's popularized the short-short story which was often planned to fit on a single page. Knox Burger was Collier's fiction editor from 1948 to 1951 when he left to edit books for Dell and Fawcett Publications; he was replaced by Eleanor Stierhem Rawson. The numerous authors who contributed fiction to Collier's included Ray Bradbury, Eleanor Hoyt Brainerd, Willa Cather, Roald Dahl, Jack Finney, Erle Stanley Gardner, Zane Grey, Ring Lardner, Sinclair Lewis, E. Phillips Oppenheim, J. D. Salinger, Kurt Vonnegut, Albert Payson Terhune and Walter Tevis. Humor writers included Parke Cummings and H. Allen Smith. Serializing novels during the late 1920s, Collier's sometimes simultaneously ran two ten-part novels, and non-fiction was also serialized. Between 1913 and 1949, Sax Rohmer's Fu Manchu serials, illustrated by Joseph Clement Coll and others, were hugely popular. The first three Fu Manchu novels by Rohmer were actually compilations of 29 short stories that Rohmer wrote for Collier’s. A 1951 condensed version of the book Day of the Triffids by John Wyndham also appeared. Leading illustrators contributed to the covers of Collier's. They included C. C. Beall, W.T. Benda, Chesley Bonestell, Charles R. Chickering, Howard Chandler Christy, Arthur Crouch, Harrison Fisher, James Montgomery Flagg, Alan Foster, Charles Dana Gibson, Vernon Grant, Earl Oliver Hurst, Percy Leason, Frank X. Leyendecker, J. C. Leyendecker, Paul Martin, John Alan Maxwell, Ronald McLeod, John Cullen Murphy, Maxfield Parrish, Edward Penfield, Robert O. Reed, Frederic Remington, Anthony Saris, John Sloan, Jessie Willcox Smith, Frederic Dorr Steele, Jon Whitcomb and Lawson Wood. Other top illustrators contributed prolifically to their short stories. They included Harold Mathews Brett, Richard V. Culter, Robert Fawcett, Denver Gillen and Quentin Reynolds. In 1903, Gibson signed a $100,000 contract, agreeing to deliver 100 pictures (at $1000 each) during the next four years. From 1904 to 1910, Parrish was under exclusive contract to Collier's, which published his famed Arabian Nights paintings in 1906-07. December 1905 advertisement for Collier's magazine's exposé of the patent medicine fraud, culminating in Samuel Hopkins Adams' 11-part series, "The Great American Fraud"
When Norman Hapgood became editor of Collier's in 1903, he attracted many leading writers. In May 1906, he commissioned Jack London to cover the San Francisco earthquake, a report accompanied by 16 pages of pictures. Under Hapgood's guidance, Collier's began publishing the work of investigative journalists such as Samuel Hopkins Adams, Ray Stannard Baker, C.P. Connolly and Ida Tarbell. Hapgood's approach had great impact, resulting in such changes as the reform of the child labor laws, slum clearance and women's suffrage. In April 1905, an article by Upton Sinclair, "Is Chicago Meat Clean? ", persuaded the Senate to pass the 1906 Meat Inspection Act. Hapgood had a huge influence on public opinion, and between 1909 and 1912, he succeeded in doubling the circulation of Collier's from a half million to a million. When he moved on to Harper's Weekly in 1912, he was replaced as editor for the next couple years by Robert J. Collier, the son of the founder. Arthur H. Vandenberg, later to become a prominent Senator, had a brief stint as a Collier's editor during the 1900s. H. C. Witwer was a war correspondent in France during World War I. Rob Wagner covered the film industry for Collier's during the 1920s. They reversed their position on prohibition in 1925. This was due to the difficulty in enforcing the referendum, and people's unwillingness to stay away from alcohol. The new law brought about bribing, thieving, corruption and other ills, which far exceeded their expectations. This new alignment gained favor with the public and helped to rebuild circulation. Writers such as Martha Gellhorn and Ernest Hemingway, who reported on the Spanish Civil War, helped boost the circulation. Winston Churchill, who wrote an account of the First World War, was a regular contributor during the 1930s, but his series of articles ended in 1939 when he became a minister in the British government. Carl Fick was a Collier's staff writer prior to World War II. The magazine's roster of top cartoonists included Charles Addams, Carl Anderson, Stan and Jan Berenstain, Sam Berman, Sam Cobean, Jack Cole, A. B. Frost, Ralph Fuller, Dave Gerard, Vernon Grant, Jay Irving, Crockett Johnson, E. W. Kemble, Hank Ketcham, George Lichty, David Low, Bill Mauldin, Virgil Partch, Mischa Richter, William Steig, Charles Henry "Bill" Sykes, Richard Taylor, Gluyas Williams, Gahan Wilson and Rowland B. Wilson. Irving's association with Collier's began in 1932, and his "Collier's Cops" became a mainstay of the magazine during his 13-year association with it. Joseph Barbera, before he found fame in animation, had several cartoons published in Collier's in the late 1920s and early 1930s. The circulation battle with The Saturday Evening Post led to the creation of The Collier Hour, broadcast 1927–32 on the NBC Blue Network. It was radio's first major dramatic anthology series, adapting stories and serials from Collier's. The hour-long program initially aired on the Wednesday before weekly publication, but switched to Sundays to avoid spoilers with stories that appeared simultaneously in the magazine. In 1929 the program began to incorporate music, news, sports and comedy with the dramatic content of the show. During World War II with William L. Chenery as editor (1941), Collier's readership reached 2.5 million. In the October 14, 1944 issue, the magazine published one of the first articles about concentration camps. It was Jan Karski's "Polish Death Camp," a harrowing account of his visit to Belzec. The now problematic title is explored in "Polish death camp controversy" (under heading "use and reactions"). Karski's book Story of a Secret State (which contained the Collier's excerpt), was published later that year by Houghton Mifflin. It became a Book of the Month Club selection, and bestseller with 400,000 copies sold in 1944-45. The Collier's selection was reprinted in Robert H. Abzug's America Views the Holocaust: 1933-1945 (Palgrave, 1999). Collier's had a circulation of 2,846,052 when Walter Davenport took over as editor in 1946, but the magazine began to lose readers during the post-World War II years. Collier's published a regular men's fashion feature contributed by Esquire co-founder Henry L. Jackson and also published long-awaited images from the 200-inch (5.08 m) Hale telescope's first light in 1949. In the early 1950s, Collier's ran a groundbreaking series of science-based articles speculating on space flight, Man Will Conquer Space Soon!, which prompted the general public to seriously consider the possibility of a trip to the moon, with the percentage of Americans who believed a manned lunar trip could happen within 50 years changing from 15% to 38% by 1955. In 1951, an entire issue described the events and outcome of a hypothetical war between the United States and the Soviet Union, entitled Preview of the War We Do Not Want. Collier's changed from a weekly to a biweekly in August 1953, but it continued to lose money. In 1954, John O'Hara became a columnist with his "Appointment with O'Hara" column. The magazine ceased publication with the issue for the week ending January 4, 1957. Princess Grace of Monaco was featured on the cover, pregnant with her first child Caroline. The company also published the Collier's Encyclopedia, Collier Books and the Collier's Year Book. Patricia Fulford edited Over 100 Best Cartoons from Collier's, Ladies Home Journal, Redbook, The American Magazine, Saturday Evening Post, The New Yorker, Argosy, Sport (Checkerbooks, 1949), and Collier's cartoon editor Gurney Williams edited Collier's Kids: Cartoons from Collier's About Your Children, Holt, 1952. Collier's fiction editor Knox Burger chose 19 stories for Collier's Best (Harper & Bros., 1951), and he also selected Best Stories from Collier's (William Kimber, 1952). A huge history and collection appeared with the publication of the 558-page A Cavalcade of Collier's, edited by Kenneth McArdle (Barnes, 1959). Cornelius Ryan's 1957 book One Minute to Ditch!, about the successful ocean ditching of a Pan American Boeing 377 Stratocruiser, was an expansion of his Collier's article in the December 21, 1956. Ryan was an associate editor of the magazine during the mid-1950s, and the novelist Lonnie Coleman was an editorial associate during that same period. ^ "Collier's Weekly, Issues of 1942". ^ ""About Us", Collier's, February 2012". Colliersmagazine.com. 1957-01-04. Retrieved 2018-02-12. ^ a b c d e f g Mott, Frank Luther (1957). A History of American Magazines, Vol. IV. Cambridge, MA: Harvard Press. pp. 453–479. ISBN 978-0674395503. ^ a b c "Collier's Rise and Fall". collectingoldmagazines.com. Also The American Magazine by Janello & Jones, 1991. ^ "Falls Dead in the Riding Club Early This Morning. Doctor Too Late. Head of Publishing House. Worked His Own Way Up from a Humble Beginning to Ownership of Collier's Weekly". The New York Times. April 24, 1909. Retrieved 2011-11-18. Peter F. Collier, publisher of Collier's Weekly and well known in society here and abroad, dropped dead of apoplexy in the Riding Club, at 7 East Fifty-eighth Street, early this morning. Mr. Collier had been attending the annual horse show which the club gives, and death overtook him as he was descending the stairs to the street. ^ a b "NEW TRIAL FOR POSTUM CO.; Collier's Suit to be Reheard -- Minority Opinion for $50,000 Verdict". The New York Times. 1912-02-17. ISSN 0362-4331. Retrieved 2018-06-09. 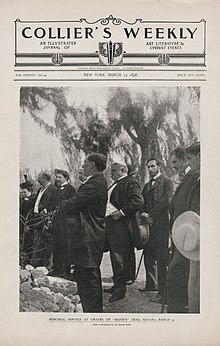 ^ a b "Collier's Plant to Move to Ohio; Publication Follows Others That Have Left New York Because of Union Conditions". The New York Times. Retrieved 2016-04-17. ^ By BRUCE WEBERJAN. 12, 2010 (2010-01-12). "Weber, Bruce. "Knox Burger, Agent and Book Editor, Dies at 87". The New York Times, January 12, 2010". Nytimes.com. Retrieved 2018-02-12. ^ Lerner, 2010, p.10. A designer of U.S. postage stamps. ^ Tom Heintjes. ""The Thin Black Line: Jay Irving and His Cartoon Cops," Hogan's Alley #14, 2006". Cartoonician.com. Retrieved 2018-02-12. ^ ""This Little Gag Went...", Time, August 12, 1946". Time.com. 1946-08-12. Retrieved 2018-02-12. ^ Dunning, John (1998). On the Air: The Encyclopedia of Old-Time Radio. New York: Oxford University Press. pp. 163–164. ISBN 978-0-19-507678-3. ^ Jackson, Henry L. "Index to Henry L. Jackson articles in Collier's". Unz.org. Retrieved 2018-02-12. ^ "January 26: 60th Anniversary of Hale Telescope "First Light"". 365daysofastronomy.org. Retrieved 2018-02-12. ^ "Collins, Martin J. After Sputnik, HarperCollins, 2007". Books.google.com. 2011-03-22. Retrieved 2018-02-12. ^ Crowell-Collier Publishing Company Archived 2013-11-04 at the Wayback Machine, Abandoned. Retrieved 2013-10-16. ^ Lee, Charles (1951-06-02). "Lee, Charles. "Nineteen for the Easy Chair", Saturday Review". Unz.org. Retrieved 2018-02-12. Lerner, Mark (2010). Charles R. Chickering: Cachetmaker - Part I.
Wikimedia Commons has media related to Collier's. Finding Aid, Crowell-Collier Publishing Company Records, 1931-1955 (PDF). The New York Public Library Humanities and Social Sciences Library Manuscripts and Archives Division.